While the weather certainly feels like it’s winter, the season doesn’t officially begin until December 21. Before then, it’s crucial to finish repairs and protect your fence from the harsh winter weather to ensure it lasts until spring. 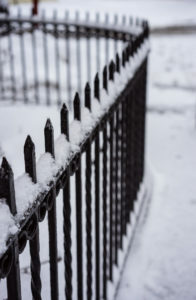 Continue reading to learn how to protect your fence from the freezing temperatures, snow, and ice. During the long winter, wood fences are exposed to wet conditions of snow and rain without any warm weather to allow it to dry. Wood does not do well in the rain and snow, as moisture softens wood fibers, which results in mold and rot. In order to protect your wooden fence from winter precipitation, clean the space between posts and rails and apply a waterproof stain or sealant. Be sure to also apply a protective finish on your fence before the winter season to ensure it stays in good shape until spring. Wood also does not like changing temperatures, as it expands and contracts as the weather increases and drops. This is an issue in the fall as well, as the weather is very unpredictable and the temperature often fluctuates. Repair any knotholes before the winter, as they can be a breeding ground for rot and pests. During a snowstorm, branches can get very heavy with dense snow and snap off. Snow and ice can even weigh down overhanging trees, which pose a danger to your home and fence. Before the first snowstorm, it’s crucial to trim back any branches that appear to be possible threats to keep your fence safe from destruction. With all of the rain and snow in winter, water is likely to saturate into the soil, resulting in sinkholes and landslides in your yard. These shifts can affect the posts of your fence and cause major damage. Take the time now to inspect your fence posts and make necessary repairs, then continue to check on the posts throughout the winter to ensure they are straight and stable. This entry was posted on Thursday, November 29th, 2018 at 5:19 pm. Both comments and pings are currently closed.